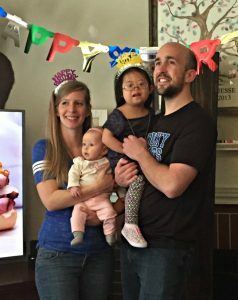 Archive by category "Family Stories"
For Down Syndrome Awareness Month, we checked in with Lindsey and Jesse, who adopted the sweetest girl Caroline last year. 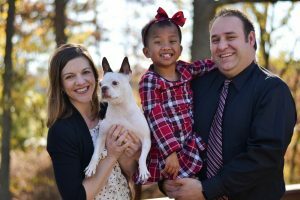 Once they saw her picture during their adoption search, they fell in love. At that moment, they knew they had found their daughter. When we previously spoke with Lindsey, she said, “We don’t see her as a little girl with special needs, we see her for her bright smile, adorable pigtails, and the daughter we will love with every fiber of our being.” This time, we hear about how life has been since Caroline came home. To read more about their journey to find Caroline, visit our blog here! Click here to watch a touching video of Caroline meeting her mom for the very first time! Did you expect to parent a child with Down syndrome? How has it been since Caroline came home? Have you experienced any challenges, and what has been rewarding? 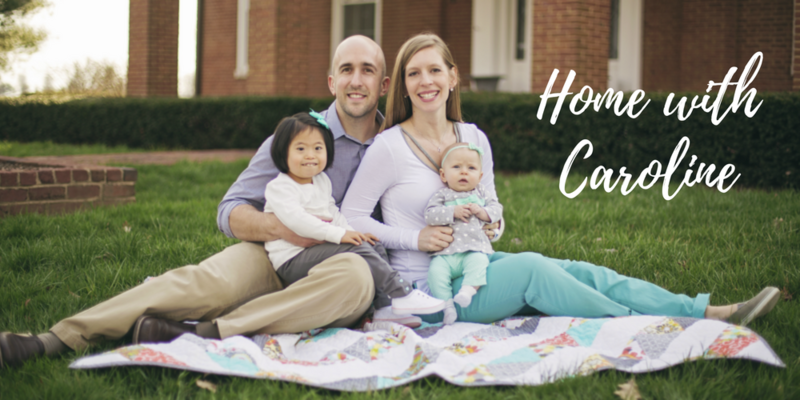 “Having Caroline home has been so incredibly wonderful. 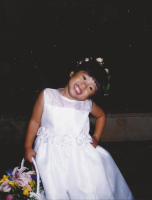 She is so eager to learn and has blossomed at home and in school and her therapies. She is so loving and freely offers the best hugs with soft pats on the back and sweet kisses. She loves to be a big sister and comes running when the baby cries, waving a pacifier or stuffed toy to make sister happy again. The greatest challenge I think has been navigating the communication barrier and having realistic expectations. 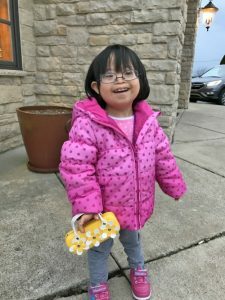 We have a child who doesn’t speak English but communicates in her own way, and it has been a challenge to us as her parents to learn what that is. Not to mention we don’t know where to start with our expectations because we didn’t develop with her; she came to us with her learned strategies that we don’t know. It can be very overwhelming to not feel understood, and Caroline does struggle with expression and can shut down and give up when we don’t understand each other right away. 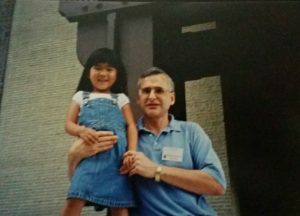 Is there anything you wish you knew before adoption? 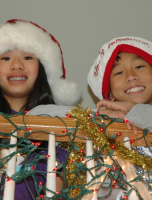 This blog post was shared by one of GWCA’s adoptive families. 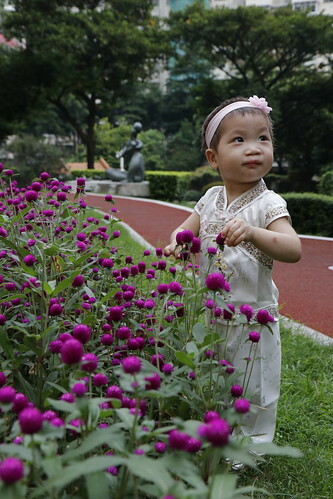 This family recently traveled to China to bring their daughter home. 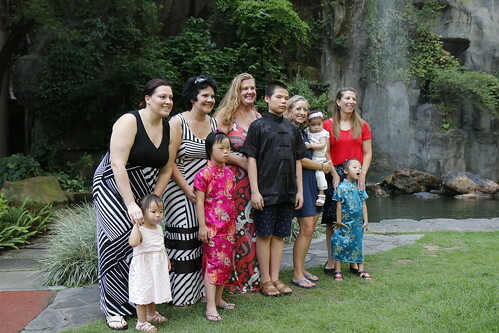 While they were there completing their own adoption journey, they had the opportunity to see FOUR other GWCA families complete their adoption journeys as well! 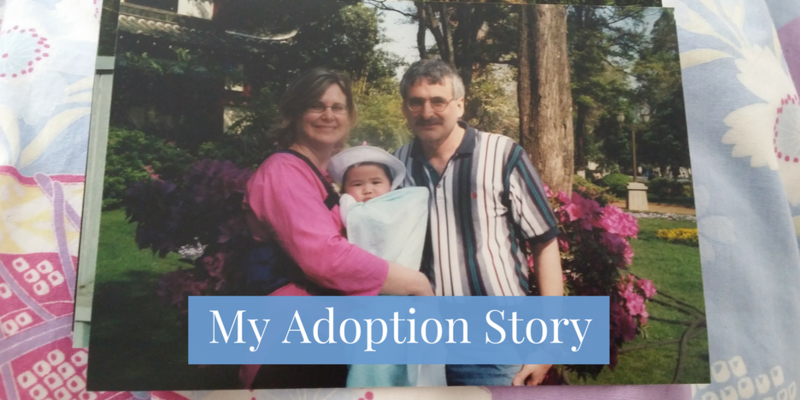 AUGUST 1, 2017 | BY VALERIE G.
I am moved by adoption stories. 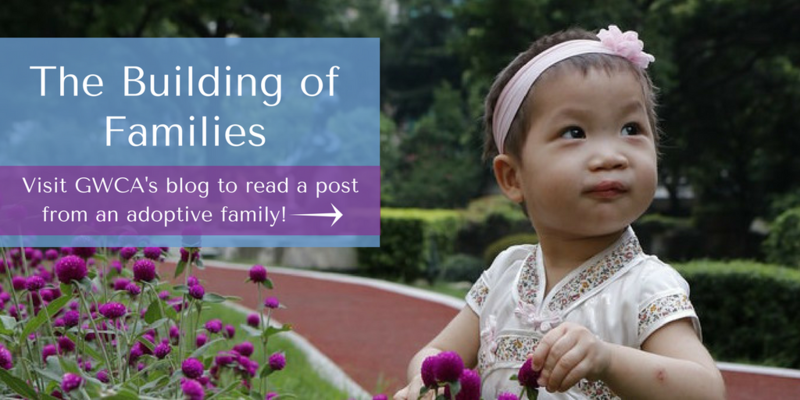 I love reading how children are joined with their forever families. How God in His providence chooses children and parents and builds families – not only in the traditional way, but also in the redemptive way because our world is broken. Even in the painful and heartbreaking circumstances where children are left without parents, God has made a way for restoration, for hope and healing and a home for the least of these. I am moved reading such stories. Now I have my own story, and I have front row seats to four other stories. 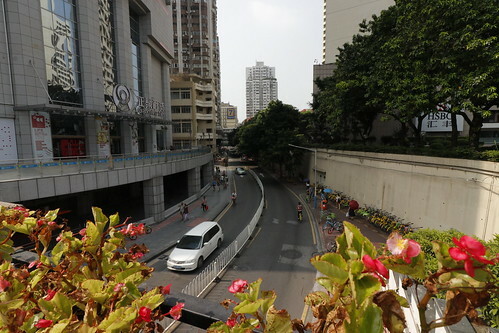 I write this glancing out of our hotel room window from the 21st floor in Guangzhou, a city of 16 million people, the 4th largest city in China. High rise buildings touch the sky in every direction. The highways are a blurred with vehicles. Sidewalks never cease from the motion of pedestrians. 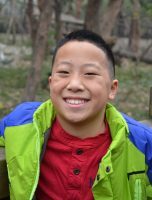 Yet here, in this huge city in China, our lives have merged with four other American families, all with our own unique adoption stories. 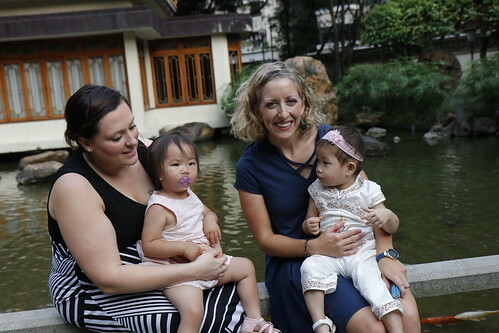 All with the same adoption agency, our lives intersected here in Guangzhou, here where families are built. How can I articulate this miracle? 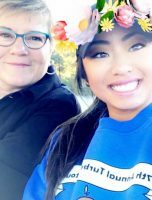 When I’m sitting in the Civil Affairs office waiting to finally see my own daughter in person, I have the honor of seeing other families meet for the first time. The boy running to his father’s arms for their first embrace. The reluctant girl who loves her nanny, yet wants to be with her new sisters and parents too. 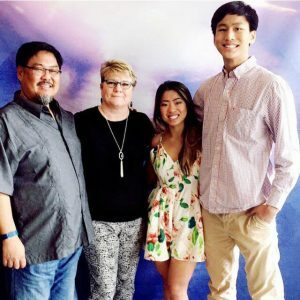 The parents who have sacrificed so much to get halfway around the globe – for love, for their child, yet knowing that this, the building of a family, is hard. The children, these precious ones who have endured more loss and pain than many of us combined, they are being grafted into their forever family. With some pain. With enduring the loss and confusion of their entire worlds changing. With strangers who they are slowly getting to know over the past week, learning that their needs will be met. That they can trust us. That we are here. That we’ll fan them and give them a drink in the heat. That they arrive with us at the many official appointments and then they leave with us. Together. 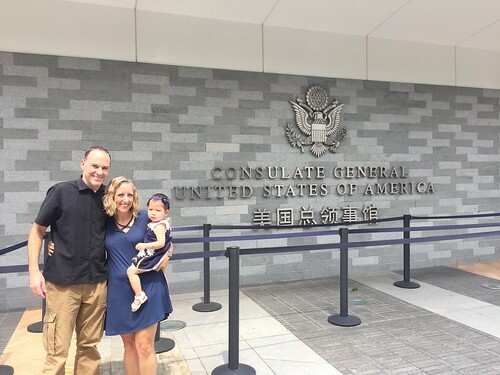 Together the five families arrived at the US consulate office yesterday morning for our ceremony. Together we took the oath. 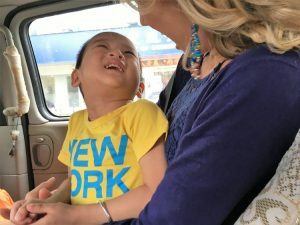 Together, husband and wife approached the window with their Chinese child to answer questions. Together, the newly built family came back and sat down, waiting until the next family was finished. Together we walked back to meet our guide. Together we cross through crazy traffic that does not stop for pedestrians! Together we ride the bus back to our hotel, one dad in our group playing Michael Jackson on his phone for Hugh, an older adopted child, because he knows Hugh likes it. Together we all hear “Thriller” on our commute. And I smile. I knew adoption was a miraculous gift in my own life. But to witness adoption happen right before my eyes with families I’ve known for less than 10 days is an experience that even after trying, I just cannot describe. Words fail for what my heart feels. What blessings await us? To watch these children grow and flourish in their forever families will be one of life’s sweetest joys. For I had the honor of being here at the beginning, when they joined their forever families. So to Hugh, thank you, sweet boy, for showing me everyday that joy is a choice. You are not limited by what you can’t see, but choose to see things brightly. 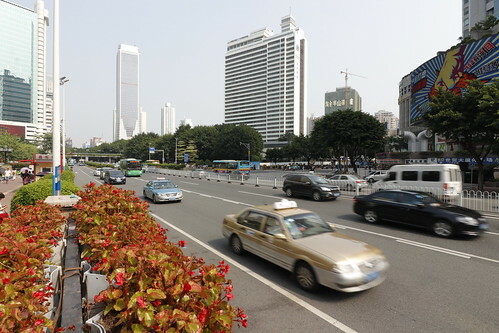 Your pleasant and happy countenance brightened my days here in Guangzhou. You are so brave and an amazing young man. I’ll miss hearing you say my name. And now anytime I hear “Thriller,” I’ll smile and think of you. See you later, Hugh! To LuLu, sweet girl, you are so brave. You’ve had big changes and now you are right where you need to be with your mama and baba and sisters. I love your friendliness and your determination. Thank you for sharing your crayons with our Kyla girl. 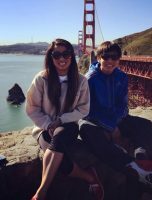 I look forward to seeing you flourish with your sister Lily as you two have similar beginnings and a beautiful future. 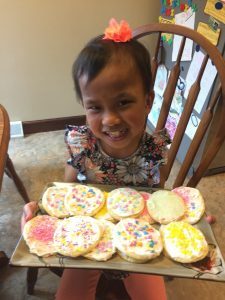 To Nora, sweet girl, you are precious in His sight. I met your parents just a couple days before they met you to bring you home. I’m sure you know, but your mama and baba are full of love for you and your family. They are such great people, and I am so happy for you to grow up in their love. You are courageous, Nora. I know how scary it is not to see clearly, yet you are calm and courageous. I hope you enjoy seeing this beautiful world God gave us with your new glasses. I am excited to see you grow, dear one. To Amani, sweet girl, I know these are big big changes for such a little one. You are resilient, sweetie. You have a mama and baba who love you to the moon and back. They have come so far, through so much, to bring you home. I love your caring heart, Amani. Thank you for reaching out and hugging our Kyla girl yesterday morning. Could you sense something we couldn’t? Your sensitity was touching as you showed love to your new little friend. 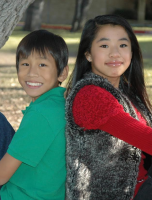 You two are close in age, the littlest adoptees of our group, but you both have big bright futures. And to Kyla, our sweet girl. I know right now all of this doesn’t make much sense. The driving. The heat! The eating ramen noodles and Starbucks sandwiches in our hotel room. The dinner at an Irish pub with American rock-n-roll playing. The coming and going and waiting. 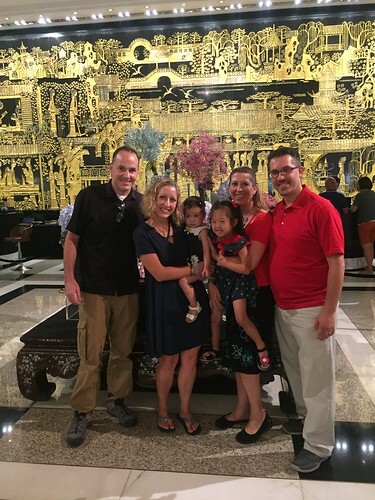 The strange looking grown ups (no offense, friends) with their Chinese children who we travel with. But over the past nine days, you’ve stolen my heart. The way you pull our fingers as you “run” down the hall, then pause and gleam up at me with the most joyous look I’ve ever seen. The way you slurp noodles using your tiny fork. They way you carefully inspect pretty things. The way it takes you a while to wake up, that’s my girl! How you look at yourself in the mirror, you with your pretty dress, shoes, and bow. You are beautiful, Kyla Brooke. Beautiful and sweet and smart and silly. I’m so incredibly happy God chose to build our family with you. You are resilient, precious one. It has been one heck of a week, but you have handled it better than any adult would. As have your friends. You five kiddos are amazing. I am truly honored to have met you all and witnessed your first days with your forever families. You have showed such strength in your first years of life. Now as you continue to grow, you will have the family God gave you to lean on for support, to laugh with, to establish traditions, to go and see new things, and to be loved. Family is beautiful. Happiest of homecomings to y’all! Eight months ago we shared a story about a family reuniting with their host kiddo to bring her home forever. 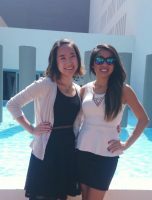 It was a reunion that they had been anxiously awaiting from the moment they had to say their goodbyes at the end of the hosting program. 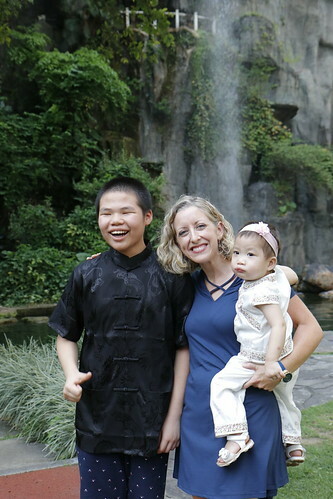 Although the family was certainly sad to see their daughter, “L,” return to China after the hosting program, they knew that they would be seeing her again soon as they had already begun submitting their paperwork to adopt her. 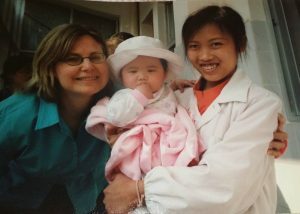 Throughout the month that L spent in the United States with the hosting program, she was able to see life outside of her orphanage and experience the love of a family. These experiences ultimately helped to ease their transition transition upon returning home as a family of three. Now, eight months later, L is thriving in her new family! 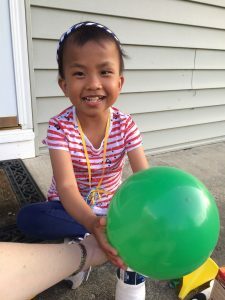 Read our blog below to learn more about L’s transition and the many firsts she’s experienced in the eight months that she’s been home. Click here to read about L’s journey home! L loves to drive by and point to the EIU castle. 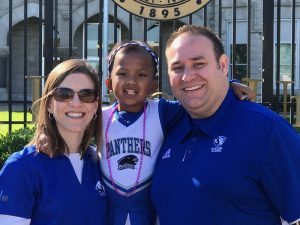 She begged and pleaded to go there and finally got her chance during EIU’s Homecoming. She got to meet Billy the Panther and go to her first parade. We visited Tent City and she cheered on the Panthers at her first football game. We had a special afternoon with Papa Swing and Grandma Barb at Aikman’s Wildlife Adventure in Arcola. The highlight was the Wagon Tour where we got up close and personal with the animals and even got to feed them. The zoo is going to seem boring after this special trip. 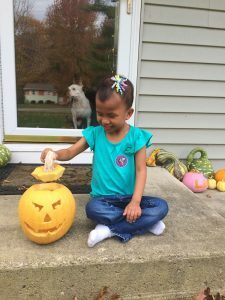 This was her first Halloween and she enjoyed carving her first pumpkin. Mommy also visited her school for her classroom Halloween party. By this time, we have gotten our rhythm and routine down. L is loving going to school and making new friends. We enjoyed a visit from special friends and L loved all the extra attention. It’s always so great to catch up with good friends! We visited Santa Claus at the Festival of Trees and enjoyed face painting with Kinsley and Charlie. We also had a great Thanksgiving with family and friends. L started the month with the Trojet Dance Clinic. She loves to cheer and dance so it was no surprise that she loved it. Even now months later, she randomly starts doing dance moves from the routine she learned. 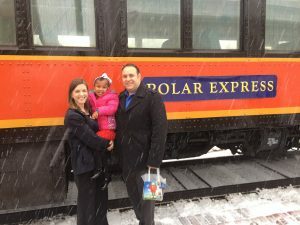 L had been asking to go on a train ride so we obliged by having lunch with Santa on the Polar Express in Monticello. She asked Santa for a dress because what girl doesn’t want a dress?! It was a snowy afternoon and really set the mood for the trip. She was just excited because she got to eat chips in her sack lunch. 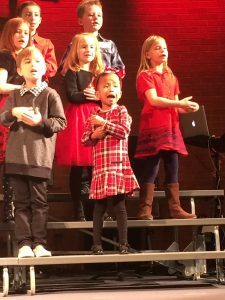 L was the star of the Broadway Christian Church Christmas Program. She sang her heart out and was very enthusiastic about her performance. She kept up with the hand motions and was also one of the loudest. Unfortunately, she didn’t know most of the words even after weeks of practicing. She could sing Jesus very clearly, but that was about it. Everyone still seemed to enjoy watching it. Santa Claus found our house for Christmas. She was very excited about him going up and down our chimney. He left L a new bicycle. 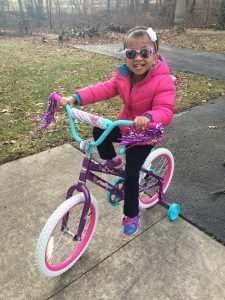 She was awfully concerned because her bike was too big and she needed a little bike like her best friend’s. A great ending to our 2016 and fun to see how much she has changed in one year. We started the year by taking L to her first movie at the theater. She did really well. 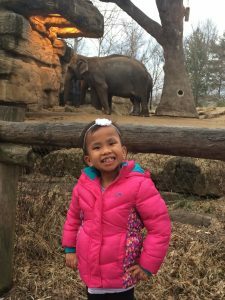 Due to the unseasonably warm temperatures, we were able to visit the St. Louis Zoo in January. 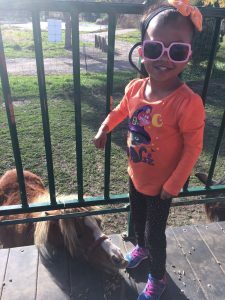 She loved visiting all the animals and can’t wait to plan another visit. 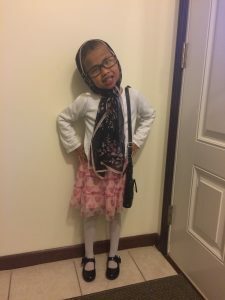 L celebrated the 100th day of school and enjoyed dressing up as a “grandma” with all her classmates. This was our first year celebrating the Chinese New Year. The holiday fell on Saturday, January 28th. This was the first day of the Chinese lunar calendar. CNY 2017 was the year of the Rooster. 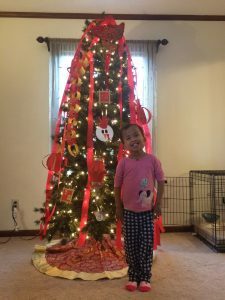 We celebrated by making decorations and re-decorating our Christmas Tree, enjoying traditional Chinese food from the Asian market, and reading a few books about the holiday. We also went to a special event at the Urbana Free Library. We ended the month with L’s 10th birthday party. We enjoyed a small party with close family at home. 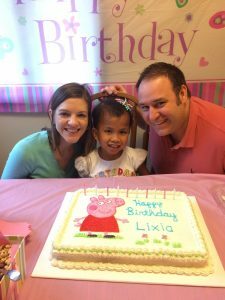 She enjoyed the special cake [Peppa Pig] that Grandma Barb made for her, unwrapping gifts, and having everyone sing to her. This girl isn’t shy about being the center of attention. L and Baba enjoyed their first daddy-daughter dance at Broadway Christian Church. They were a beautiful couple and had a great evening. L’s favorite part was going out to eat for “china food” beforehand. 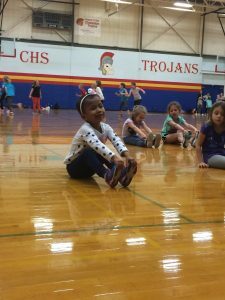 L loves all things dancing, cheerleading, and gymnastics. So when we have events that she can participate in, we try to take full advantage. She is so limber and flexible, we have no doubt that with practice, she will probably excel. 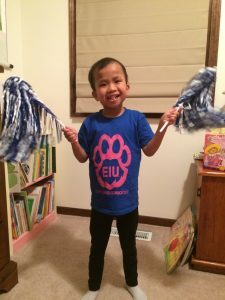 This month she did an EIU cheer clinic and did a beginner gymnastics class through the Recreation Department. As the weather has warmed up, we have spent more and more time outside. She loves to play bubbles and use sidewalk chalk. She is working on riding her bicycle but after a couple of falls, she is understandably apprehensive. She has gotten so much stronger! We did a fun science experiment where we inflated a balloon by the reaction of vinegar and baking soda. She has also learned how to play baseball with a wiffle ball and bat. Her hand-eye coordination has improved so much she learned immediately and gets tons of hits. We had special visitors came over to play. She was excited about eating pizza, doing puzzles, playing Barbies, and playing Go Fish. We were so amazed at how far she has come in interacting with other kids, playing, and communicating. It was an eye-opener for us. Especially since it had been several months since she had seen them. W e celebrated our first Easter. 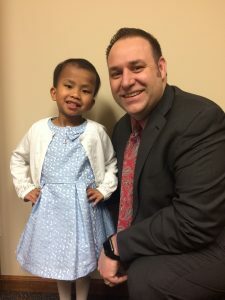 She talked about wearing her special dress to church for weeks. 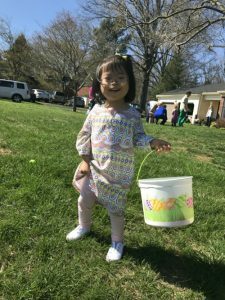 She enjoyed coloring Easter eggs and seeing which colors could be combined to make new colors. The Easter Bunny found our house and left her a basket with some special treats. 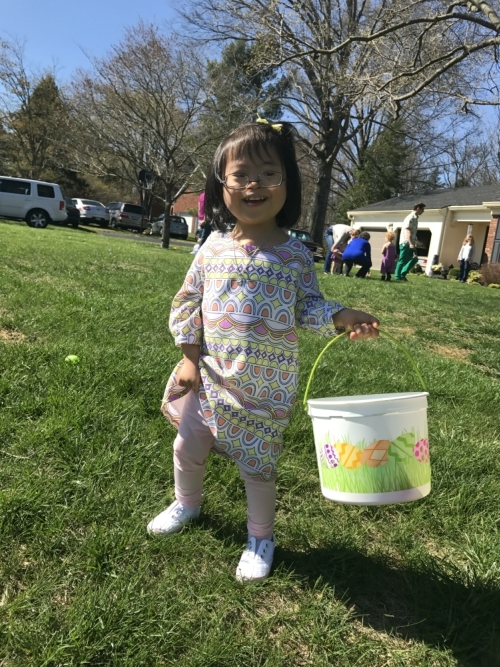 Since she does not like sweets at all, the eggs that she found contained coins and she was very excited about taking them to the bank. We compromised and she added them to her bank at home. She also got to attend a birthday party for one of her classmates. It was held at the Flip Zone. She was very uneasy around the trampoline, but by the end, she loved it. 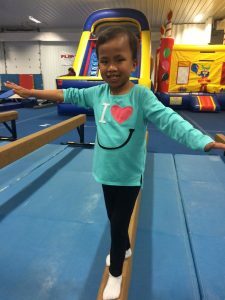 She practiced walking on the balance beam and can’t wait to go back. She has made some great friends in her class and it was fun to watch them play together. Overall, it is amazing to see how far L has come. She has lost three baby teeth and has new permanent teeth coming in. She has gained some weight and is now up to 38 pounds. She has grown in height, advanced a shoe size, and started to gain muscle strength and fill out. Her hair is growing and thickening up. She begs to have long hair. She loves to put together puzzles, build with Legos, and play Barbies. Food is still her love language. She out eats us most days. She is always open to trying new foods and is such a good eater. She loves to snuggle with Mommy and Baba. She is absolutely in love with her “sister” Bessie. Bessie is our dog and if you remember when she visited last winter, she was absolutely terrified of the dog and screamed bloody murder. 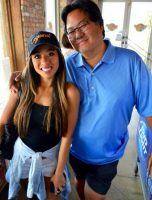 If you have had a recent conversation with her, she probably asked you if you had a dog, what its name is, if it is big or little, and whether it is inside or outside. If you asked her dog’s name, you likely got the response “B-E-S-S-I-E.” She really likes to spell the words that she knows. She is doing great in school and above average in her recognition/reading of sight words. It makes my heart-swell to hear her read the leveled readers that she brings home. This girl loves math. Her vocabulary improves everyday and her spoken English continues to get stronger. Her handwriting is beautiful and she concentrates so hard to make every letter or number “pretty.” Astounding progress for a girl who had never been to school, had never used a pencil, put together a puzzle, and whose coloring consisted of scribbling. She loves to sing along to the radio. One of her favorites is Hillary Scott’s “Thy Will Be Done.” She loves to belt out songs in the car and exclaims, “I know this song.” Still working on the concept that songs are made up of words:) This girls loves to sleep. Every Friday night she says “sleep long time” aka let me sleep in. I’m not sure how we got so lucky for God to choose us to be her parents, but our lives are blessed by her presence every minute of every day. She fills our lives with joy with her smile, orneriness, and sassy personality. They say the best gifts are the ones money can’t buy, and I’m learning each day how much truth is in that statement. Appreciate the people who are genuine, kind, supportive, and who will love you no matter what. 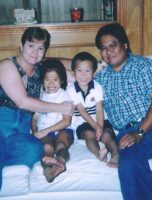 Twenty one years ago, I was granted God’s greatest miracle – a family. Hello to anyone who is reading this! My name is Samantha. I turned twenty one years old this past February, and was born in Lishui, China. In 1996, Snow Wu established what you know as Great Wall China Adoption. 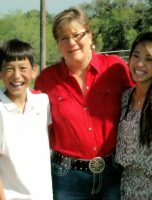 Who knew one woman was about to change the lives of many orphaned children like mine? 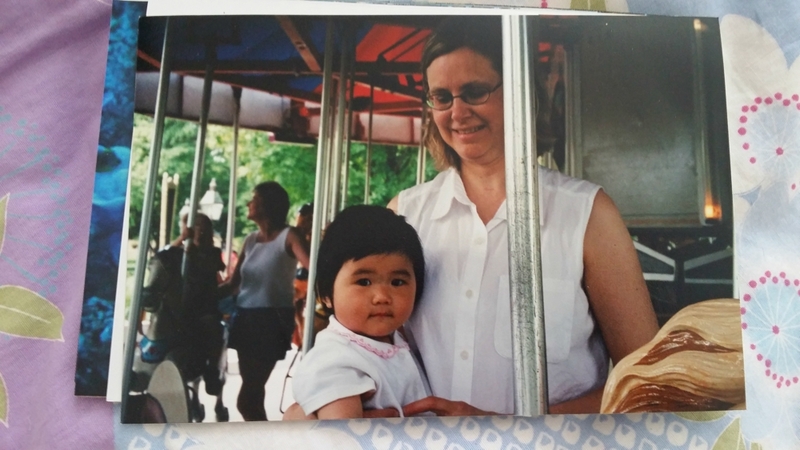 I was the first child to be adopted at ten months old from the Great Wall of China Adoption Agency along with two other girls, Meghan and Rachel, back in 1996. Life in the United States has truly been a blessing, and I owe it all to God and the people he’s put into my life. 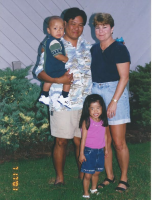 I was adopted by a family that has been able to provide beyond a child’s basic needs. 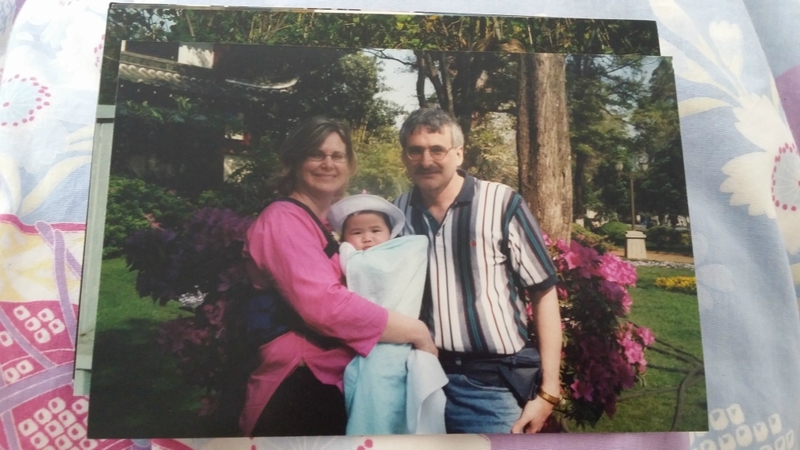 My parents, Scott and Angela, weren’t able to have children of their own. They prayed that one day they would have a family. 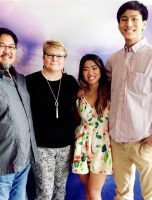 God answered their prayers, and led them to adoption. Never in a million years did they think that adoption would be the route they would take. Of course they were scared, but there wasn’t anything more they wanted than to have a family. With a strong faith and the help of Snow Wu, their dreams finally came true. They flew across the world to find me. 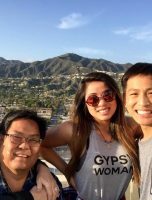 Four years later, they went back to China, and adopted my brother, Alexander. 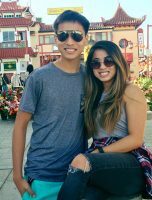 Ever since I was little, my parents have always encouraged my brother and I to try new things and put ourselves out there; I don’t remember a time where we weren’t involved in some type of physical activities. 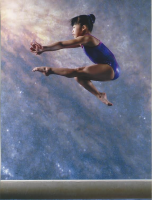 My greatest accomplishment related to sports was when I decided to join competitive gymnastics at four years old. At eleven years old, I ranked twelfth in Texas for my division. I endured many long hours, days, weeks, months, and years of hard work to accomplish the success that I did at such a young age (4 ½ + hrs. a day). I was not even in middle school at the time and learned to balance my academics, social life, and my extracurricular activities. 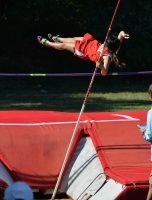 After I ranked in the state I decided to leave competitive gymnastics and try other sports. 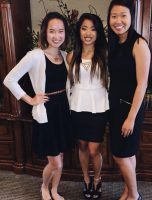 I was able to play competitive volleyball, basketball, softball, pole-vault, tennis, track and field, and dance. I was honored to be named one the Silver Dancers in high school, whose team has ranked five consecutive years at the annual Nationals Competition. 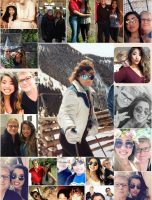 I’m so blessed for all of the people I’ve met along the way and the memories I’ve made so far. Through everything, my parents have made it a priority to be involved in me and my brother’s lives. Since day one, they have always been our biggest cheerleaders out there. We were privileged to attend private school for the majority of our lives, where we grew in our spiritual faith and met people who would serve as a positive influence in our lives. 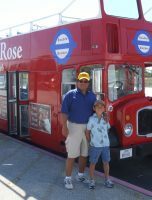 Each year we are committed to going on a family trip. I’ve been extremely lucky to explore different cities, states, countries, and continents all around the world. I love travelling, hiking, going to concerts, shopping, interior design (DIY projects), hanging out with friends, blogging, and fitness. I’m currently in college where I am double majoring in Business Marketing and Public Relations, and have made the Dean’s List two years in a row. I plan on either becoming a wedding planner who focuses on destination weddings or being heavily involved in corporate event planning/sports entertainment. We live in America, where dreams come true. If you’re scared of adoption, don’t be. 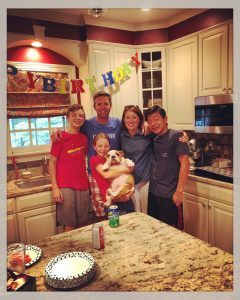 I wouldn’t be the person who I am today, if it weren’t for the greatness of God, my family, and Great Wall China Adoption. Family doesn’t necessarily mean you’re related by blood. The people who will love you on your best days and even more on your worst days are considered family to me. My parents have hearts of gold, and will forever be my heroes. I know that whatever obstacles life throws my way that my parents will be there to support my brother and I, and they’ll have our backs like no one else. I’ll forever be grateful for my parents pushing us to be the best we can be, and teaching us to live a Christ like life every day. They truly inspire me like no one else I have ever met, and have taught me to stay true to who I am no matter what. I’m a strong believer that even though life can seem scary and unpredictable, everything happens for a reason. God has a journey for each and every one of us, so trust that he will guide you to the path you’re meant to be on. 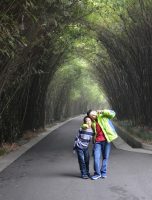 For my parents, their paths sent them across the globe, to find what they were yearning for, which was a family. People ask me all of the time if I would want to meet my biological parents, and my response is always the same. The people who’ve raised me since I was ten months old are my parents, they’re all I’ve ever known, and having them in my life is all I really need. I wouldn’t trade them for the world, and will forever appreciate everything they’ve done for our family. Thank you to God, Snow Wu, my parents, mentors, and my lifelong friendships I’ve established in America. I hope someday I can leave an imprint on somebody else’s life like they have all made on mine. 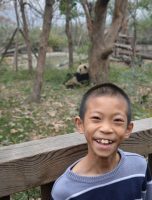 If you’re interested in learning how you can begin your journey with GWCA’s China adoption program, contact our matching specialists or visit our Waiting Child photo listing today! 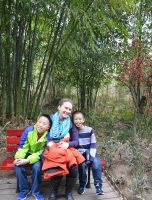 Three and a half years ago, my husband and I fell in love with an 18-month-old boy from China. He was precious. He was perfect. And he had medical special needs. 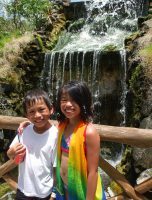 Having two biological children of our own at the time, we had no prior experience with caring for children with medical needs. 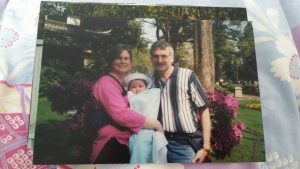 And although my sweet hubby was a physician assistant very eager to love on a child he could provide for in our home, both of us, at times, wondered if we were really equipped to care for a child who would require multiple surgeries and daily assistance of some sort, especially when we had two other children in our home already. Distant friends told us this would too drastically change our lives. Acquaintances told us our biological children would be ruined. People who heard our story asked why we would choose to disrupt our comfortable life — the life with two children in a comfortable home and no health issues to worry about. Especially when we had no idea what we were doing. 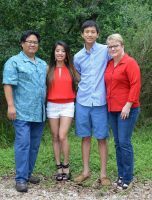 There were seconds, moments, throughout the adopting process when, even as we LONGED to hurry the process and hold the sweet man we had nicknamed Superman in our arms, we wondered if these people were right. If God really knew what He was doing. If we were really the Kents for the job. It turns out, we didn’t know what we were doing. And God did. And those people with their sweet protective hearts and their very good intentions — their opinions, combined with our fear, could have robbed us of one of the greatest blessings of our lives. THIS is what adoptive parent Michelle knows now that she wishes paper pregnant Michelle would have known then. 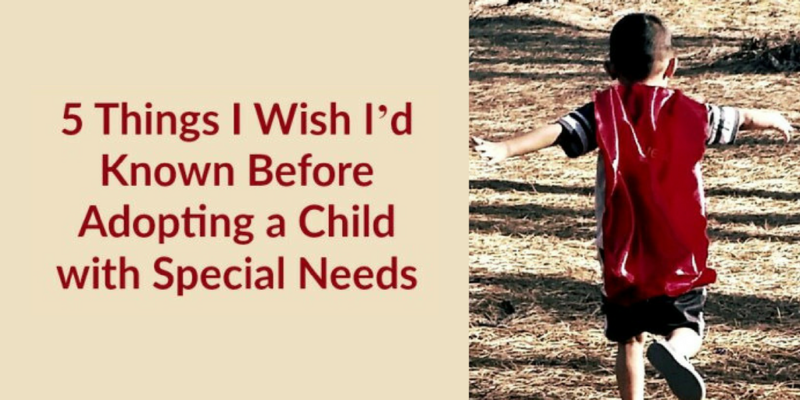 Because the world was very good at preparing us for the HARD parts of adopting a child with special needs … and very silent on the topic of the BLESSINGS. 1. Special needs aren’t scary. Not when you fall in love with the face and the personality and the little spirit of the soul behind them. The second I held that sweet 2 ½-year-old hand, Superman moved from a photo of a child “with medical special needs” to MY SON. And when the child is your SON, not a file or a case number or a medical record, there is nothing you wouldn’t do for him. 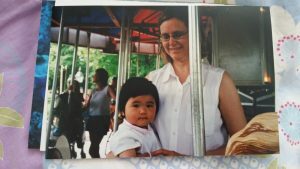 God replaced my fear with fierceness and my concern with courage, and suddenly, almost overnight, the scariest thing about our situation of caring for a child with medical needs was that WE ALMOST LET FEAR ROB US OF THE PRIVILEGE OF DOING IT. Because perfect love casts out fear. God’s perfect love poured into our imperfect hearts for HIS perfectly wonderful son drove out our fear. When Superman became a FACE and not a FILE, special needs became not scary. Because we quickly discovered that what the world called “special” needs were actually some of Superman’s greatest superpowers —and what MADE him the spirited overcomer that he is. 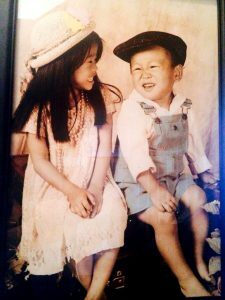 When he was lying in a hospital bed on Day 6 of NPO — without any food or water for nearly a week — and all I wanted to do was sneak him a cherry tomato and a sushi roll, because I knew his favorite foods of all time would instantly cure the grumpies I’d been facing for days. 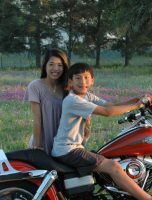 When he was in the operating room a little longer than I had imagined, and I sat twitching, waiting with other kid-less parents in the waiting room for someone to call my name. But when the child is a FACE and not a FILE, a son or daughter and not a photo, fear goes out the window. And the only thing scary is the thought that you might have missed out on the most beautiful blessing of your life had you let some Latin words on paper define your future. 2. If God calls you, He will equip you. We’ve seen it in our own lives. God doesn’t call equipped people; He equips the called (Hebrews 13:21). Because frankly, NONE of us are prepared and mentally, emotionally and physically equipped to parent children who require care we’ve never performed. Not biological parents who deliver children with needs they had never imagined; not adoptive parents who God calls to bring home children with needs they had to Google. But just like God equips parents who DELIVER children with special needs — parents who research and study and devote hours upon hours to learning how to provide the very best care for the children God has given them — God equips parents who BRING HOME children with those same needs. In His goodness and by His grace, God turns parents from WORRIERS into WARRIORS. Parents who worry that they’re not enough. That they don’t know enough. That their patience and their skills and their temperaments and their knowledge are all not enough. He equips. And in OUR WEAKNESS, He shows up STRONG. 3. Hospital stays make great bonding opportunities. In his lifetime, Superman has had 14 casts and 10 surgeries, most of them inside our home. He’s spent several overnight visits at children’s hospitals across the country, and two years ago, he spent an entire week in a hospital without food or water following an intense surgery that made me quiver. 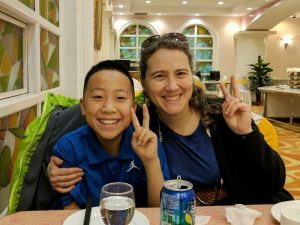 This then 4-year-old boy wasn’t concerned about IVs, anesthesia or amputations; after numerous surgeries, he was concerned that he would get his Mama time. The time that I have learned is more precious than almost any other time we have in our chaotic, busy worlds. Because when we’re in the hospital together, we get to turn off our loud and noisy lives. We get to turn off our responsibilities and our phones and eat mediocre hospital food while we watch Frozen marathons (I can sing “Let It Go” in my sleep) and play checkers and read piles of books and snuggle day in and day out. And even though I dread the pain and the tears that follow each surgery, I now treasure that special bonding time that the two of us get together. 4. Special needs are not a burden for our biological children; they are a BLESSING. 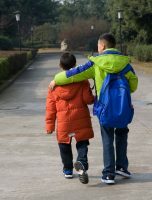 Perhaps more than any other concern our friends had when we shared we were bringing home a child with special medical needs was the concern that our biological children would be negatively affected. That they would have to sacrifice too much. That this would become a burden for them. The truth is, they do sacrifice. And it’s good for them. 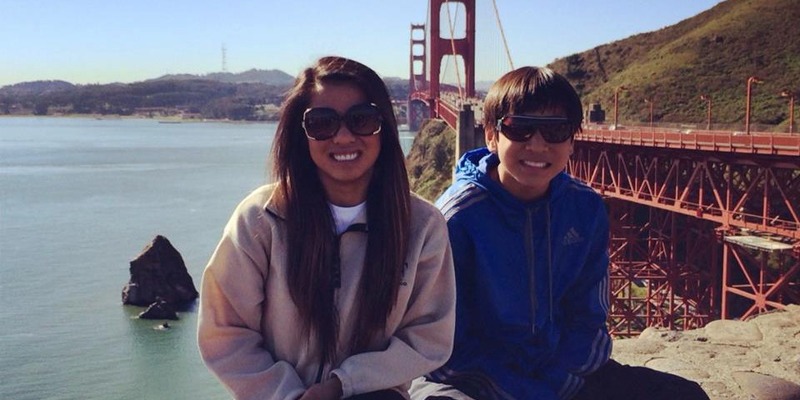 They do give up occasional outings and fun things for doctor’s visits and medical appointments. And it’s good for them. They do hear “we can’t eat that” or “we can’t do that” because of the medical needs or attachment needs of their little brother. And they’re fine with it. In a culture that is raising children to believe life is all about them, that life is all about tailoring every schedule and every minute to their every need, our biological children are learning that life is NOT all about them. That sometimes the needs of others, like their brother, requires some sacrifice on their behalf. That loving others sometimes means giving up that school festival or that extra sport for the good of the team that still wants to maintain nightly family dinners and margin for important family conversations between doctor’s visits and guitar lessons. That their little brother gives up his time (and his sanity) to sit in copy rooms and class parties in order to serve THEIR needs. And that ALL of us in this thing called “family” do give and take in this life to make this family unit work. And frankly, we haven’t heard once why it’s unfair that they’ve had to alter their lives after bringing their little brother home. They adore this boy. They treasure this boy. They tackle this boy like he’s been part of their team their entire lives, and they are the first to dote on him and run to him and make him get well cards before and after every surgery. They adore him. And loving a little brother with physical deformities and medical needs has taught them not to run FROM those who look different or spend more days in hospitals that the average person — but to run TO them. 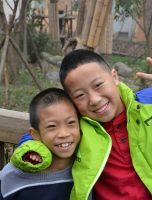 So that this summer, when we hosted a 10-year-old orphan from China who had no fingers on his right hand, our children never even noticed. They never even asked. They tackled him with hugs and smiles and immediately invited him into their world to play for a month. Compassion is worth far more than a few more extra-curriculars on our calendar. 5. Although we, in our selfish human nature, thought WE would be the ones blessing a child with medical needs, it turns out that HE was the one who blessed US. I don’t want to paint too rosy of a picture. There are definitely hard days. When my husband was deployed, Superman was on cast No. 14 and driving back and forth to our ortho specialist an hour and 20 minutes each way with three kiddos crammed into the back of a Prius was not the joy of my life. When our calendars are dominated by doctor’s appointments and occupational therapy assignments and we have to say no to birthday parties and playdates because we’re driving back and forth to children’s hospitals. When we still deal today with some of the very same medical issues we faced the day we brought this precious man home, even after surgeries to correct them. The difference is our attitudes. The difference is our perspective. The difference is that, ON THIS side of adopting, we know that it’s all worth it. So very, very worth it. The 132 million orphans still waiting for forever families to call their own — adopting them is WORTH IT. 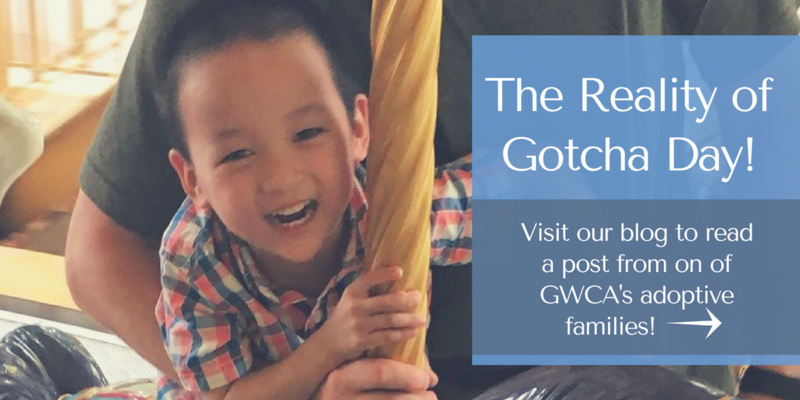 If your family is open to adopting a child with special needs and you’d like to learn more about GWCA and CAN’s Waiting Child adoption programs, visit our website or contact us today! 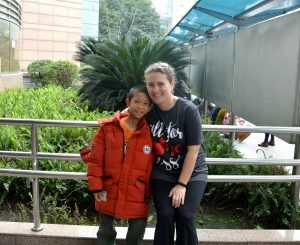 After participating in our Orphan hosting program and saying a difficult goodbye to one of her soon-to-be sons (“SC”), this amazing mom and her family have been hard at work to complete their adoption process and bring him home forever. 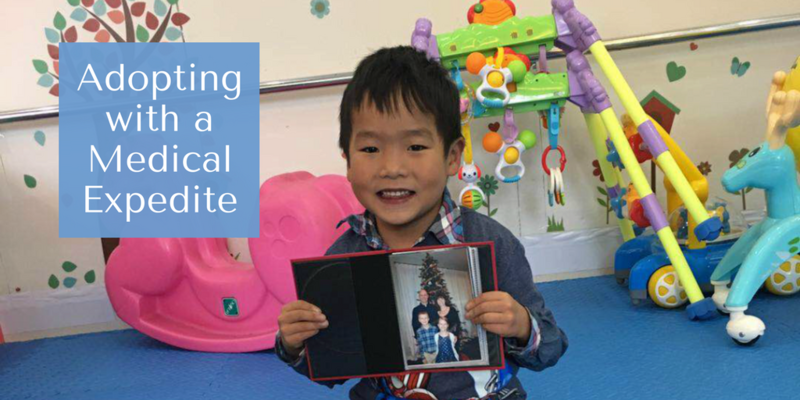 During their adoption process, they fell in love with another amazing boy who was hosted by an advocate family, and their family grew by one more! Now, they’ve finally reached the part of their journey that they’ve been longing for – the trip to China to bring their boys home. Below are the stories from both of the boys’ Gotcha Days, as well as an emotional visit to SC’s finding place. Check back soon for an update on this incredible family’s journey! God is so good and has answered so many specific prayer requests. The transition has been amazing so far with DJ. When we arrived at the hotel, both of us were a little unsure of what was going on. 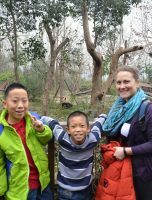 The orphanage staff told me that he had been asking every few minutes when I was arriving because he was ready to go. So much for less luggage, he came home with 2 backpacks and another bag full of toys! I need to buy another suitcase already. He had a whole backpack of just snacks for me. He told the staff all morning that no one else could eat the snacks but his mom! When we first started talking between us and the translators, he started to cry. He quickly told my guide that they were happy tears because he was so glad to finally have a family. He said that he has wanted a mom and dad of his own, forever. He has totally won my heart and already has me wrapped around his finger. Showing me a book full of pictures from his childhood. What a HUGE blessing this is. They also gave me the outfit he came to the orphanage in as a baby. Both of these are invaluable gifts!! After leaving the hotel meeting where we signed paperwork for guardianship for the night (our adoption will be official tomorrow), we headed to get our family photo. As we walked, I held DJ’s hand. At one point I had to let go, he quickly grabbed my hand again as we started walking. When we got back to the hotel, I gave him his Lego set and that kept him busy for over an hour. He is very inquisitive and asks a lot of questions, which has been difficult with the language barrier. We are slowly figuring things out though as we go. He is already working on English words and I’m learning more Chinese. After months of work and prayers, I was reunited today with SC. before SC went back to China, Wayne and I told him that every time he saw the moon, he was to remember that we were in America praying for him. We were not able to tell DJ that (as we were not his host family), but we were praying for him as well. God has continually been gracious and merciful to us throughout this entire process. Today was no exception. I was blown away once again by God’s grace and compassion. He truly loves these children. I had so much trouble sleeping last night. I was so excited for today that I felt like a kid going to Disneyland. Even DJ woke up and the first thing he asked was, “SC?” We ate an amazing breakfast and then piled into the van to drive to SC’s orphanage. Originally we were going to have the family day at the Civil Affairs Office, but it got moved to the orphanage. What a blessing that was! It was amazing to see where SC has lived the last 10 years. The orphanage was beautiful and colorful. You could tell that the workers genuinely love the children. We were ushered into an office after meeting one of the chaperones from the summer hosting. DJ loved seeing her again. We did some paperwork for temporary guardianship (adoption is finalized tomorrow). I was blessed with another photo album book with baby pictures and pictures of SC’s childhood. We even have a note from his birth parents that they left with him and he was abandoned! After a few minutes, SC finally arrived. It was so wonderful to see his sweet smile and to hug him again. We were able to catch up and talk a little with all the workers. We then all proceeded to walk through the orphanage to SC’s foster parents’ home, which was on the same property. SC got to show me his bedroom, his awards from school, introduced me to his foster parents, and even played the piano for us. It was such an amazing opportunity. I feel so blessed to have seen and experienced this part of his life. At one point his foster mom started crying. She has cared for SC for 6 years and helped him when he had surgery on his foot. She also just said goodbye to another foster daughter last week. She was adopted as well. I was able to hug his foster mom and tell her how much we appreciate all that she has done for SC. It was beautiful, heart breaking, and surreal all at the same time. So many emotions in the room. SC has been non-stop smiles. DJ and him are getting along as though they are long lost brothers and best friends. We spent the afternoon playing Legos, transformers, and we also took a little walk. One cannot forget food. Both of these boys can eat!! SC shared his snacks from his foster parents with DJ in the car. It was so sweet. He also brought out a bag of cookies and said it was for Baba and his sisters. He is so thoughtful!! This evening we went to a Chengdu Opera where they have the famous mask changing show. Both of the boys had a blast. Seeing SC’s finding place was special, but it also stirred up a ton of emotions. I happened to see a mom feeding her small baby and I wondered what went through SC’s parent’s minds when they sat him in an area they knew he would be found and could receive help. They had cared for their sweet baby boy for three months. They left a note on him. I still have to have someone translate it for me all the way, but they explained that he needed help with his foot. I cannot imagine the anguish they experienced leaving behind this baby they loved in order for him to get the medical help he needed. Visiting this spot not only stirred up emotions for me, but it must have stirred up emotions for SC as well. It is one thing to read about and take training on trauma and loss, it is another thing to experience it first hand. About five minutes after we got into the van, I looked back to talk to the boys and I saw that SC didn’t look well. He looked distressed. When I asked him what was wrong via the guide, he told her that he was experiencing car sickness. This surprised me because he never once was car sick over the last two days or over the month he was with us this summer. Emily (our guide) quickly surmised the situation and said that he was probably experiencing a lot of emotions that were making him sick, and he didn’t want to admit it but say it was just car sickness. SC told me he felt nauseous and very dizzy. I looked it up and emotional distress can make people feel physically ill, including feeling nauseous and dizziness. 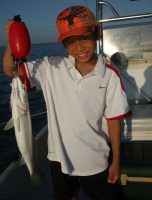 It broke my heart to see my son hurting so deeply that he felt sick. I encouraged him to always feel free to express his feelings to us and I also told him how much we all love him. I told him that we would always be there for him and he can tell us anything and we will listen. It took him about 20 minutes to feel better. It breaks my heart to know that our boys will probably always have questions, experience hurt and pain from their past, and feel lost at times. This is one reason I have tried to hard to document everything I can about this trip through pictures, saving memorabilia like newspapers, taking pictures of foster family members, and even taking pictures of finding places. All of these pieces will help me answer future questions, to the best of my ability, to help them through their struggle. 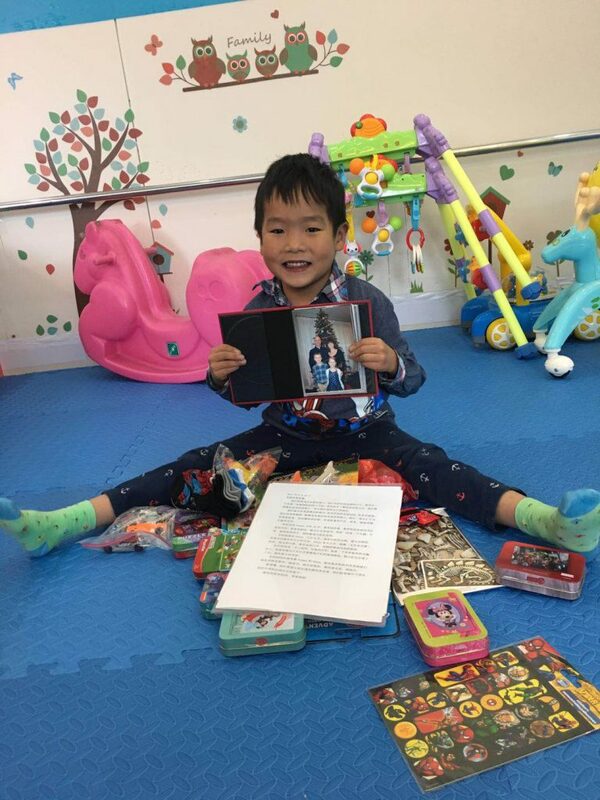 This is why I also feel so blessed to have important things like DJ’s outfit when he was found, a copy of SC’s finding letter, baby pictures of the boys, etc. 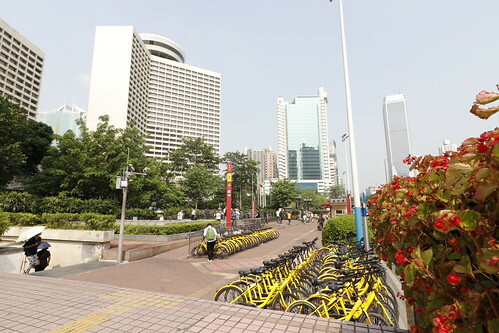 We are now in Guangzhou, where we will finish the last of the paperwork for the US side. In the end, we will have the boys’ visas so that we can travel to the United States. When the plane lands, they will be US citizens. We have really enjoyed being adventurous this trip. Our guide told us where McDonalds, KFC, Starbucks, and Pizza Hut was located. I avoid those places in the states and I don’t plan on eating Western food while in CHINA!! We ventured out tonight and found a Japanese restaurant that had amazing ramen. SC took charge and placed the order for us in Chinese. He ordered the noodle dishes and coke for me, DJ and himself. I had to fake liking the coke because I really don’t like it. SC caught me making a face when I drank it. Oops! The boys LOVE their noodles and are so fun to watch. While we were waiting for the bill, the boys entertained themselves – SC found creative ways to use his wipe and DJ figured out if he put coke in his soup spoon, he could drink it backwards.